Getting close to first engine-start. 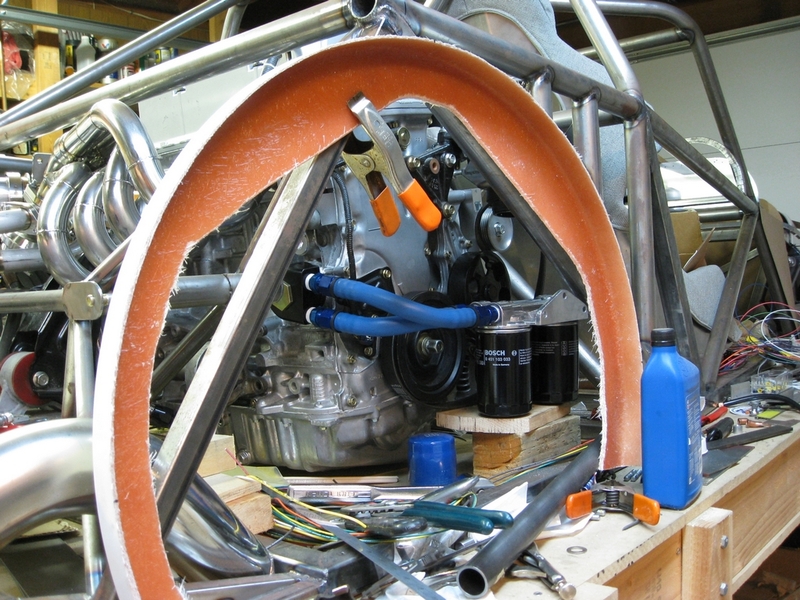 Fuel system is in, at least enough for now, the hoses stuck in a plastic gas container. Spark plugs were removed and the engine cranked until oil pressure came up. (It’s easy to tell when it does – cranking speed increases.) No leaks, that’s good. Just started bringing up the various relays and found another omitted wire, a rather important one connecting power to the ECU, explaining why the ECU isn’t able to power-up any of the other relays… The Honda ECU comes up in stages, where one wire is driven to +12 V, then the ECU starts its power-up sequence, bringing up other circuits and relays, and that’s not happening. Probably because of that missing wire – I hope. Remote oil filter is plumbed but needs mounting. This position works well: it’s out of the way, easy to get to, the hoses are short, it’s helps balance weight, and spilled oil misses the tire. 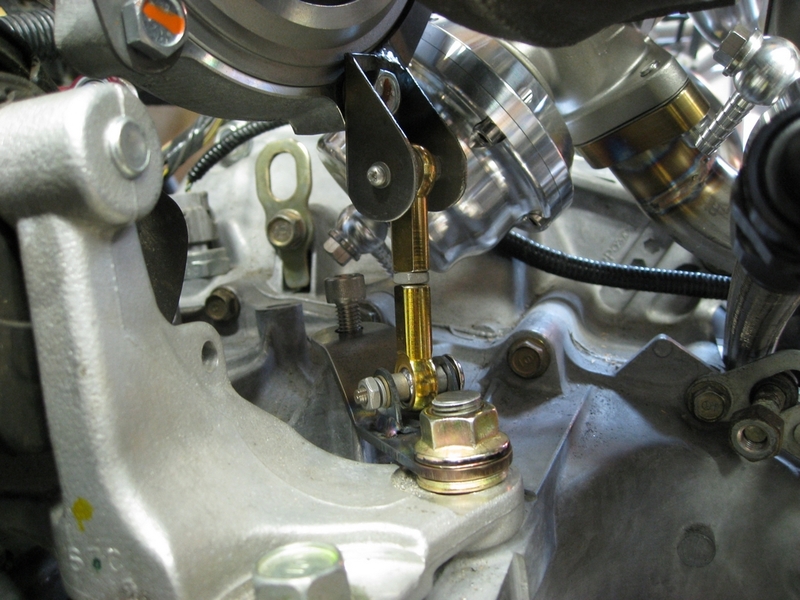 Plus, if and when an oil cooler is added, it’ll go in the right-side air-inlet, so the plumbing’s already mostly done. The filter housing is also a convenient source to drill and tap for turbo oil, oil temperature, and oil pressure sensors. 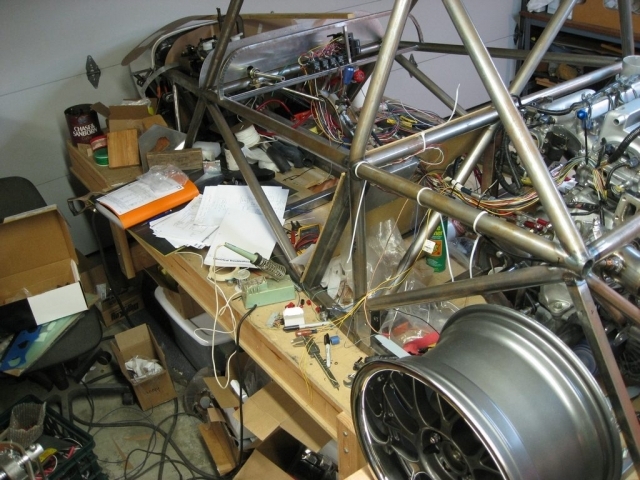 The big mess here is due to being in the middle of wiring and not taking time to clean up… hard to stop when I’m getting close. It’s a good thing the harness was unwrapped; what I labeled a ground wire was a major +12V supply line. It wouldn’t have burned anything up, but it sure wouldn’t have started. Found that the fuel pump expects a 20 amp fuse… yikes! Fortunately that possibility was designed-in ahead of time… though I expected pump current to be less. With the wiring needed for first-start is done, it’ll be brought up slowly to avoid surprises. There’s also some more fuel fittings and hose to pick up, wiring in the larger-capacity injectors – I think the electrical connectors are different. First-start will just use a plastic lawnmower gas container; no point using the real tank and smelling fumes for months. Intake manifold has to be bolted in, fuel rail, too, as does the exhaust. 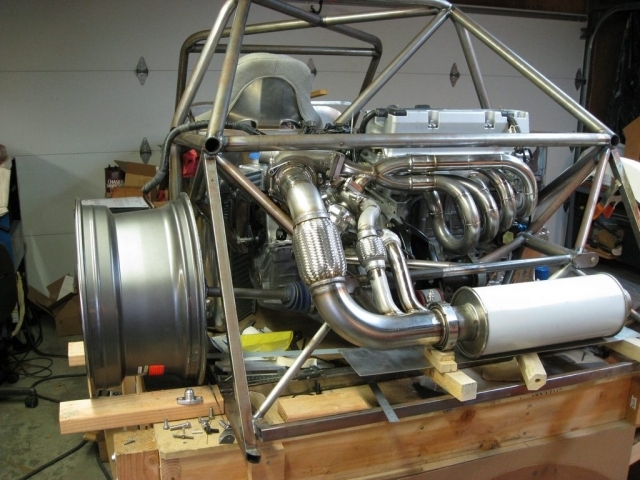 The turbine housing is out for coating, which is just as well; it means the turbo oil supply isn’t needed just yet. In case anyone thinks I did the entire electrical in just a couple days – only the wiring for starting the engine is in, which doesn’t require anything from the dash (even skipping the starter key for now.) That’s a whole ‘nother kettle of fish which will be handled later, maybe next, maybe not. In addition to wiring the entire dash is running all the wires for the lights – that’s actually the easiest part of the job. Engine-start will be sooner than later (at least, trying to start it…), maybe within a week, and yes, the camcorder will be running. I started a more detailed build log on the forum, where the logs of the two beta-builders are well underway. Since it’s so much easier to post over there I post a lot more often, blathering on about this or that, but it gives more insight into the build. Plus, comments over there are visible to everyone, instead of sending me e-mails and no one else knowing what’s going on. Electrical work continues. All the engine-ECU wiring is done, other than a couple power and ground wires to chase down. Without them it’ll either not run at all or run “strange,” and strange is bad. To make sure, the engine harness was unwrapped to see what goes where. Debugging power and ground wires can be tricky since continuity doesn’t necessarily guarantee anything – current can go any number of paths, indicating “good,” and still not be wired right. Battery cables and disconnect-switch is in, fuse box is mounted, and wiring has started on the circuits needed to start it. Also removed the turbine housing to be coated – which might not be a bad thing to have off the car for first start. Even though the manifold’s been cleaned, the shock of exhaust pulses and heat will no doubt dislodge stuff that shouldn’t go through the turbine blades. Working on electrical – there won’t be many pictures since it all looks the same. I made it tough on myself by using a block from one car, the head from another, and a harness from yet another, so there was a few where-does-this-wire-go moments. However, since that was worked out ahead of time, things are moving along fairly smoothly. 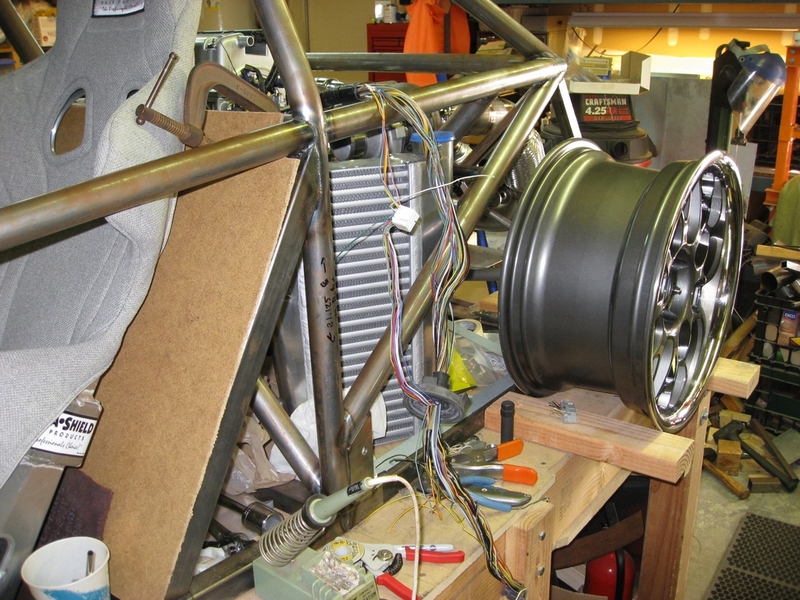 In fact, the toughest part, the engine-to-ECU connections, is nearly done. It gets easier from here on, running the necessary ECU wires forward to the dash, and after that is the really easy stuff, wiring the lights and such. Of course, the lights aren’t needed to start the car – the immediate goal by the end of the year. Right now it’s looking like it’ll happen before then. On a slightly different note, one big time-sink will be programming the flat dash. Most of the displayed variables are conveniently picked up in the CAN bus serial data – “just plug it in.” However, the OEM drivetrain has neither an oil pressure sensor nor oil temperature sensor. Both are easy to add but a bit of a project to figure out the scaling and to create the curves. All part of the fun. So now starts the long process of wiring the car. First up is placing the fusebox; placement is important for both weather weather reasons and being able to access it after the lights go out on a dark night! 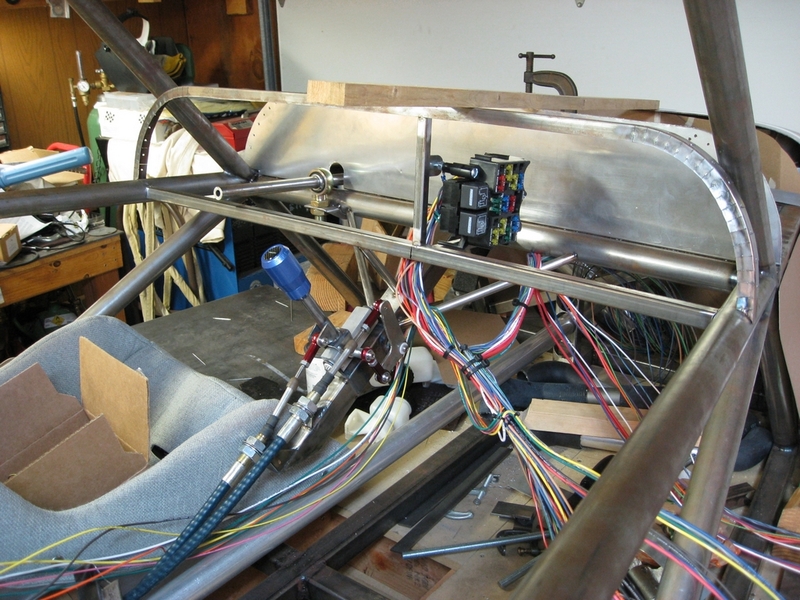 The first real wiring is the engine/ECU wiring, which goes behind the seat on the backside of the bulkhead. Shortening the harness was easy, though there’s some wires left over – who knows what they are. A paperwork task is adding a connector so the dash can be completely removed. Also made a list of missing connectors and the needed lengths of battery cables. All better now, don’t know what I had. Got the CNC-cut A-arm patterns. They’ll help trim a ton of time off making the fixtures. There a saying that we’re all connected by no more than seven people; that is, you know anyone through at most seven people. Every once in a while I find a new link. My boss at work told me how his dad was a doctor who did house-calls. One day he gets a call that someone at a local hotel had a cold and needed a visit. So he packs his bag, heads over, and is puzzled how he’s “checked out” first. Then he meets his patient… Elvis. So between me and Elvis there’s only two intermediaries. Then I started thinking of how many others have only one intermediary: Clinton, Janice Joplin, John Wayne, Colin Chapman, Patton. Smokey Yunick was zero (talked to him on the phone.) Dan Gurney, saw him. Oh, then there’s Hubert Humphrey.